For Immediate Release: Posted On 8/29/2012 By Industrial Magnetics, Inc. The new Read Rite™ telescoping inspection mirror from Industrial Magnetics, Inc., allows you to see a true, non-inverted image of numbers, letters, symbols and pictures in difficult viewing locations for the utmost accuracy in observation. Using a typical inspection mirror to read important numbers, such as model numbers or serial numbers, can lead to uncertainty or inaccuracy due to the inverted appearance of the image. 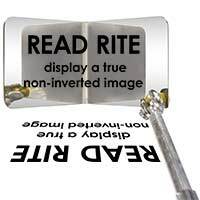 The Read Rite inspection mirror shows the numbers as they would appear if they were visually accessible to the eye, eliminating deciphering or transcription errors. The mirror, measuring 3-1/2" x 2", is constructed of non-breakable, stainless steel and is mounted to a telescoping hex rod with a double-ball hinge for 360° rotation & stability. The Read Rite weighs 1/2 lb., measures 15-1/2" collapsed, extends to 28-1/2" long and features a non-slip, solvent resistant gripped handle. The Read Rite Inspection Mirror is available to order online with QuickShip™, same-day shipping, on orders placed by 2pm EST Monday - Friday at www.magnetics.com.